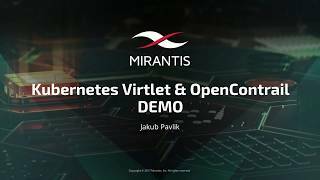 Introducing Virtlet: VMs and Containers on one OpenContrail network in Kubernetes — a new direction for NFV? Some time ago I had a meeting at one of our potential enterprise (non-telco) customers. The company had just announced an RFP to replace their existing OpenStack distribution. As we began the discussion about finding the #1 contributor to OpenStack in Stackalytics, we found the root cause of the problem, and realized that they didn’t need to find an OpenStack distribution from top vendor commits. They need to run their single application workload in large scale production. In other words, they don’t need multi-tenancy, self-service, Murano, Trove, and so on. In fact, they don’t even want OpenStack, because it is too complex to ship an immutable VM image with their app. On the other hand, running Kubernetes instead of OpenStack wasn’t the right answer either, because their app is not ready to take its place in the microservices world, and it would take at least six months to rewrite, re-test and certify all the tooling around it. That was the day I realized how powerful it would be to enable standard VMs in Kubernetes, along with the same SDN we have today in OpenStack. By including the best of both platforms, imagine how we could simplify the control plane stack for use cases such as Edge Computing, Video streaming, and so on, where functions are currently deployed as virtual machines. It might even give us a new direction for NFV. That’s the idea behind Virtlet. The previous real example demonstrates that our customers are not ready for the pure microservices world, as I described in my previous blog. To solve this problem, we’re adding a new feature to Mirantis Cloud Platform called Virtlet. Virtlet is a Kubernetes runtime server that enables you to run VM workloads based on QCOW2 images. For the sake of simplicity of deployment, Virtlet itself runs as a DaemonSet, essentially acting as a hypervisor and making the CRI proxy available to run the actual VMs This way, it’s possible to have both Docker and non-Docker pods run on the same node. Libvirt: The standard instance of libvirt for KVM. Environment variables: You can define environment variables for your pods, and then virtlet uses cloud-init to write those values into the /etc/cloud/environment file when the VM starts up. The K8s nodes are running Kubernetes 1.6 with the OpenContrail Container Network Interface (CNI) plugin, and we spun up a Ubuntu VM POD via virtlet and standard deployment with Nginx container pods. So what we wind up with is an installation where we’re running containers and virtual machines on the same Kubernetes cluster, running on the same OpenContrail virtual network. Create a pod for the VM, specifying the extraRuntime key in the nodeAffinity parameter so that it runs on a node that’s got the Virtlet DaemonSet. For the volume specify the VM image. That’s it; there is no number 3. As you can see, rather than pushing random commits, Mirantis is focusing on solving real problems, and only pushing those solutions back to the community. I would also like to give special thanks to Ivan Shvedunov, Dmitry Shulyak and all of the Mirantis Kubernetes team, who did an amazing job on this integration. If you want to reach us, you can find us in the Kubernetes slack channel #virtlet, or for network-related issues, you can find us on the OpenContrail Slack.